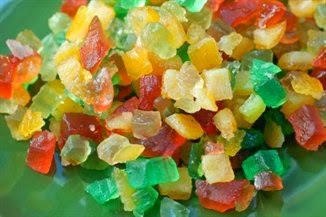 Soak candied fruit in rum for 30 minutes. LIne a 6-cup, dome-shaped cassatta mold with 1 pint vanilla ice cream. Over this, add a layer of raspberry ice and a layer of coffee ice cream. Stir rum-soaked fruit into the remaining softened vanilla ice cream and fold in 1/2 cup whipped cream. Filled center of mold. Covered with wax paper and a lid, and freeze until ice cream is firm. 30 minutes before serving, unmold onto a chilled serving plate and garnish with a cherry, citron slices, and remaining whipped cream. Return to freezer. Serves 10.